As the end of the year is approaching, I've begun my final project in stretch techniques. 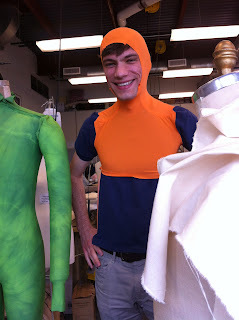 I am making a unitard that will incorporate padding to create unique shapes and forms. This unitard is a full body one, including a hood. So far, I've patterned it out, dyed the fabric, and basted it together to do a quick check on fit and to figure out the padded section patterns. The base fabric is mottle-dyed/tie dyed a bit. I began with blue and yellow and then over-dyed the whole thing with fluorescent yellow to get more of a punch. The bulges are going to be in a darker blue/green color and will feature pebbling done with silicone caulking, which we did during fabric modification last year. I'm so excited to be bringing different techniques together! The unitard fit well on the form I had made it for. I also had a thought -- I bet it would fit my friend who seemed to be about the same size. I took his measurements and compared -- pretty close! So, on a whim I did a quick fitting on him as a test...The only thing I found to alter was the arm which is a bit too large. Yay! Always cool to see what the garment does on a real person vs. the dress form. I also got to mark where to put the padding so that it corresponds better with musculature. So that's that for now. Next steps are to finish the pebbling so that I can make the hood and padded pieces. I need to pattern the padded pieces as well for both the foam and the stretch. I then need to take my basting stitches out and baste on the foam. I can then stretch the fabric over the foam and applique it on. Once this is finished, I just need to put it all back together, finish the edges that need finishing and put in the zippers! (There will be two zippers coming up from the shoulders and going up to the face).